ONE: Capitalism is a moving target and in its current globalised and financialised form, it has a tendency to extract value not just from labour but from the broader long-term health of host economies, making societies the world over profoundly troubled. Peter Lawrence described the global economy as a global casino while Munyaradzi Gwisai reminded us that in the midst of waves of deindustrialisation and attacks on working conditions, capitalists are making unprecedented profits. In more concrete terms, Samantha Ashman argued that the current crisis of steel production in South Africa is intimately tied to the global financial system as firms have been allowed to drain value out of the industry in pursuit of short-term financial yields. She commented that it is not just a problem of capital flight, but capital strike, as firms refuse to reinvest their profits back into the industry. Thus amidst the ever present message of financial inclusion, African economies are seeing their capital flow outwards. Tetteh Hormeku likewise commented that in a so called free trade system, intellectual property agreements like TRIPS no longer encourage innovation and technological advances to drive productivity growth but rather serve to solidify knowledge rents and the monopolisation of knowledge. Put simply, it would appear that in our current wave of globalised, financialised capitalism, profit has become rather worryingly delinked from productivity, and that it is extremely unclear how societies will climb out of this mess without either a great deal of pain and popular revolt or a radical re-imagining of our economic models. As Yao Graham commented, “in context of deindustrialisation and falling productivity in agriculture, people have lost faith in democracy.” Samantha Ashman similarly commented that perhaps the term ‘late capitalism’ means that it will soon be over. Yet even in relatively prosperous parts of the world, we are witnessing the political impacts of long-term declines in productivity, dwindling private (and public) investment and widening economic inequality, and it is not clear whether societies will weather the storm so easily. Within African countries, this extractive logic sits within an even harsher context of a highly competitive global division of labour and a neo-colonial governance framework that limits policy space and fiscal sovereignty. While it is true that there has been a revival of interest in industrial policy among heterodox economists and even some within institutions like the IMF have begun to acknowledge the weaknesses of their former policies, our workshop participants like Charles Abugre and Ben Fine stressed that current conceptualisations of industrial policy still fail to grapple with the challenges presented by financialisation and globalisation and pay too little attention to the relative fortunes of capital and labour within current state-led models of growth. Industrial policy is a class project, and without acknowledging the need for redistribution as part of that project, researchers are advocating for exploitative frameworks. In such circumstances, Akua Britwum commented, it is imperative that activists and trade unions move beyond immediate workplace concerns and venture into broader debates about what industrial, trade and social policies should look like in their societies. For this reason, our workshop tried to bring such activists into conversations with critical academics about growth and developmental policy. Importantly, as so many participants made clear, these different aspects of policy all depend on and feed off one another, making policy space and fiscal sovereignty all the more important for policy-makers seeking to think and craft their way out of extractive economic models. TWO: Neoliberalism is not really a manifestation of weak or rolled back states but rather a particular kind of state role that has been defined and hijacked by special interests. 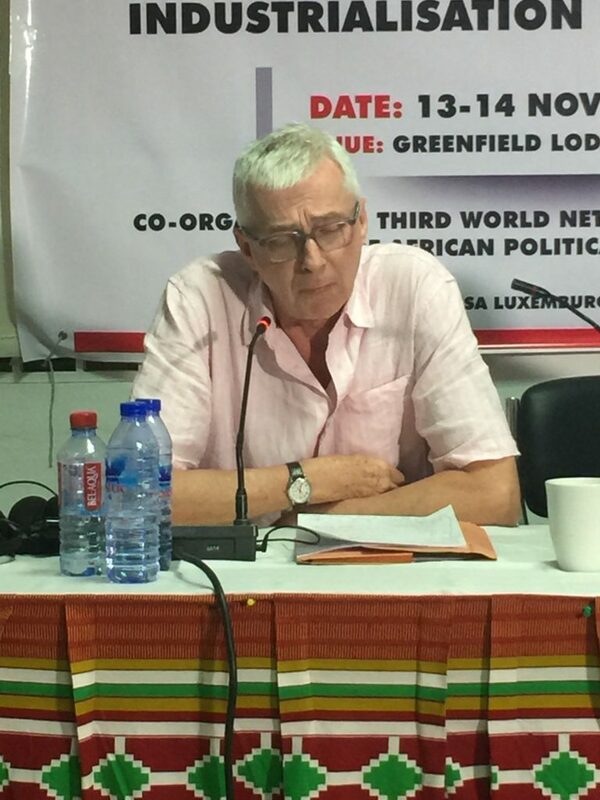 In so many presentations, we saw evidence of the state’s role in constructing the neoliberal order; Ben Fine discussed the state’s role in terms of the development of financial industries and Public-Private Partnerships, Gordon Crawford discussed the role of the state in the globalisation of Ghana’s mining sector, and Tetteh Hormeuku highlighted the role of the state in the enforcement of the TRIPS agreement. Far from acting like a night watchman, the state is present and interventionist in these restructuring processes. Clearly however, it is serving a particularly narrow set of interests that profit from the extraction process. In this vein, Yao Graham argued that only forms of public ownership and strong public interest will allow African economies to significantly transform the way that industries like agriculture and mining work for African development. Equally Ben Fine argued that industrial policy works most effectively when it has the room to redraw the boundaries of trade acceptability. When we uncover the work of the state in extraction, we make it easier to promote a state gunning for development in its place. THREE: We need to change the story about competitiveness and sustainability. There has been an appropriation of the term ‘sustainability’ by financial interests. The term no longer serves to protect social or environmental resources or rights but rather to define sustainability in terms of profitability. We are constantly asked whether a particular service or programme can be sustained without donor funding or public money. Similarly, there is a pervasive narrative about the need for ‘patient labour’ in the context of competition across nations. Yet at the same time, capital can apparently no longer afford to be patient given the high profits to be made in the here and now. Thus we are told that wage levels are too high or that long-term investment into health, learning and infrastructure are too dear. These stories make it difficult for any long-term vision of development to emerge and compete against short-term profit-making and force workers, their trade unions and the public purses into tight fiscal corners. A kind of informalisation from above has been sprung upon labour markets and public coffers. Business models have emerged to justify and re-order the transfer of surplus away from workers and citizens towards capital through public-private partnerships, outgrower schemes, bottom of the pyramid business models, cooperatives (but without the voting rights) and other informal-formalisation models, all of which serve to squeeze profits out of our economic institutions. Yet this myth about sustainability through profitability does not offer people security or wage growth in return. As discussed above, this transfer is not based on economic fundamentals. We are left with accumulation without growth or redistribution; accumulation merely for private consumption. It should be clear that if we keep focusing on financial sustainability, our economies and societies will simply not survive. They will suffocate. Sustainability must be understood in terms of productivity and redistribution once more. Economies are ONLY sustainable when there is a long-term and socially inclusive models of growth. In agriculture, Elisa Greco thus called on researchers to closely scrutinise the narratives of those who claim that they are developing productive capabilities but embody extractive logics when it comes to their labour relations. Here she was referring specifically to the case of the Nigerian conglomerate Dangote’s recent move into agro-processing and agriculture. Hibist Kassa cautioned that in the context of artisanal mining in South Africa, formalisation of the industry often results in criminalisation due to licensing laws, thereby pushing the poor further into poverty. In my own work on digital platforms, formalisation and automation often results in a concentration of capital and data away from the poor and towards the well financialised controllers of digital platforms. This tightening strategy is suicidal for if you don’t pay people enough, they won’t be able to buy and sustain growth into the future. As Akua Britwum reminded us, this approach of suffocating labour through depressed wages also stands in stark contrast to the approach taken in the independence era when workers were seen as consumers within growing domestic markets. As Charles Abugre optimistically pointed out, that while in the past African policy-makers had the policy space to engage in Import Substitution Industrialisation, it was actually much more challenging to do so with small rural African populations. Today that context has changed and it may be possible once more to craft domestically oriented and integrated industrial, trade and social policies, which do not depend on disadvantageous positions within a global division of labour. As Ray Bush commented, academics must do their bit in this process by tying in notions of social justice and harmony into technical definitions of economic transformation. African countries, like every other country in the world, need to invest in their futures through social policies, learning and domestic R&D to bolster long-term growth and shared prosperity. As Charles Abugre so finely put it, a “key area of value addition in any industrial strategy should be value addition in the brain”. To that end, we hope our workshops will move forward. 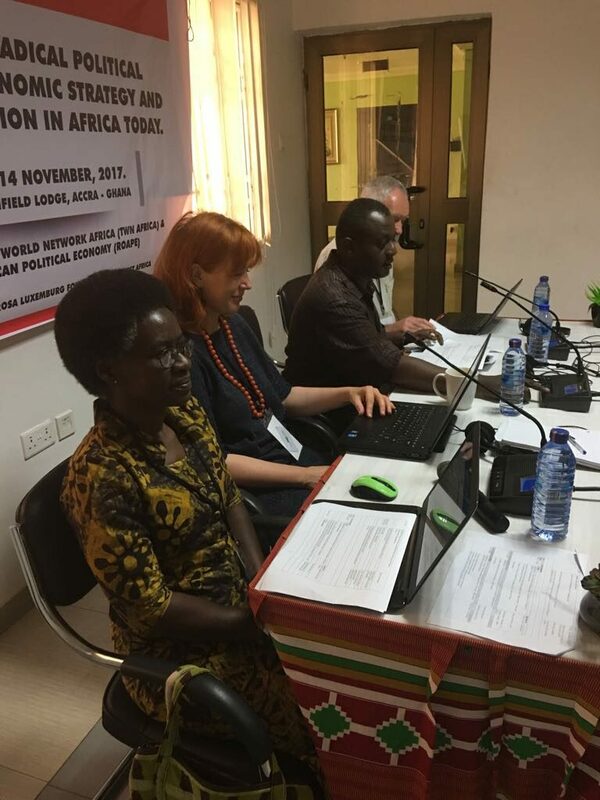 Laura Mann is a member of ROAPE’s Editorial Working Group and a sociologist whose research focuses on the political economy of markets and new information and communication technologies in Africa. She is Assistant Professor in the Department of International Development at the London School of Economics and Political Science. Featured photograph Hibist Kassa and Yao Graham. First photograph Akua Britwum, Sam Ashman, Gyekye Tanoh and Peter Lawrence; second photograph Ray Bush.